Traveller's view of space travel colored by the 3I universe has the norm and standard of starcraft at that midpoint of TL 12 with jump 3. Many iconic ships follow this pattern. Even Milieu 0 starts with the Sylea Federation not back to square zero having to reinvent jump and rediscover the universe but every other major race (except the Aslan) had that momentous event when their first Jump 1 ship disappeared into Jumpspace to return successfully with the news there's a bigger place beyond their solar boundary. This can apply to worlds crawling out of the Long Night or any race in non-3I universes. However, Jump 1 would be their Wall until they progressed to a technological level 11 which could take from decades to centuries without outside assistance. The population of these beginning star traveling civilizations would have a far different perspective. Exploration and colonization would be a monumental undertaking even with generous Mains (worlds linked by one jump). Probably the most common vessel in the yearly years will be the explorer, the precursor to the TL 12 Scout. This one is one particular design that are size efficient to do the most primary mission of system pathfinding. They gather as much macro information about a system for analysis as to the value for further research, economics and possible colonization but their spartan supply loads make long term and detailed exploration difficult without establishing supply depots and outposts. They sacrifice other amenities for enough fuel for two separate jumps as emergency and for systems without gas giants. Unlike the more advanced scout, these vessels carry a laboratory and a scientist for allowing more extensive evaluation in the short time they have. The pilot, astrogator and engineer will also have some cross training to assist in assessment. An air/raft is for any extraordinary attempts at planetside exploration. Jump 1. Maneuver 1g. TL 8 Fusion power plant (50 power), Fuel 40 (2 x Jump 1 and 4 weeks standard operation). Small bridge. Computer/5 with Maneuver/0, Library and Jump Control/1. Sensors - Civilian. 4 x Staterooms (Pilot, Astrogator, Engineer and scientist). Options: Fuel scoops, Fuel processors (40 tons per day), Air/raft in docking bay,10 x Probe drones, Laboratory (1 researcher), Workshop. What other ships would be carried by Jump 1 to the new frontier and how would they be shaped? What would early travel and criteria for world potentials with these crudest of space technologies? Would planet based or orbital supply bases be common in the beginning until larger more specialized vessels and greater endurance come into production? I was going to include a TL 8 prototype explorer but Jump Control software can't be prototyped (not a component) so the first jump ship must wait for the software to catch up. Can we stretch Jump-1 to reach Alpha Centauri from Sol? So go out to 1.4 parsecs, which should cover it. Lets say its a NASA ship, We'll assume there is $10 per credit so the price of this vessel is $350 million. Scouts are astronauts. NASA detects two planets in the Centauri System which may support life. Proxima b and Prometheus. The StarLeaper Two became the first jump-capable ship to reach this planet, in 2101 AD. In 2122 AD Prometheus successfully petitioned the Terran Confederation for home rule and became an independent nation-state. Reynard wrote: What other ships would be carried by Jump 1 to the new frontier and how would they be shaped? What would early travel and criteria for world potentials with these crudest of space technologies? Would planet based or orbital supply bases be common in the beginning until larger more specialized vessels and greater endurance come into production? I would imagine extremely robust ships. They are out in the unknown for some time, they must be able to take care of themselves. Jump drives are new technology, basically experimental, they are not necessarily very reliable. I would suggest spare drives in case they break down when you are 10 jumps out. Also a few extra Engineers to keep everything working. 200 dT, J-1, M-1, reinforced hull with light armour. Spare drives (Jump Drive, Man Drive, Power Plant), Emergency power systems. Fuel for 4 jumps and 12 weeks of power. The best computers and sensors we can fit (CORE/40, Civilian), with spares (m/10, Civilian). Medical bay and Workshop to keep crew and ship working. Crew: 8; Commander, Scientist, Navigator, Pilot, Sensor Operator, and 3 Engineers. A few missile launchers for basic combat capability and launching sensor&research drones. Some cargo capacity (7 dT) for extended supplies. For long missions some staterooms may be used for storage, necessitating double occupancy. Mine's a hundred and twenty tonner monojumper I call the Venture class. Maybe I should call the lead ship Mongoose II. Nothing this early really prevents these ships from traveling far out. It will just take longer with jump-1 instead of something better. This would require only a few changes to make ships last that long. If you had an obstacle such as not having developed fuel scoops or fuel refining equipment, then travel might become more complicated. I see nothing wrong with making jump software prototype stuff. Just add in a 6x price multiplier like you would with other prototype equipment. Maybe double the bandwidth requirements for TL + 2 software. Defects could be a -1 or -2 DM to astrogation tests. That would make jumping dangerous and would require that all ships carry skilled astrogators to compensate. Maybe this would make them high in demand and thus expensive. Yes, Prometheus is Alpha Centauri on the Traveller map and still difficult to reach whether 2 parsecs on the map or 1.4 parsecs in our reality. In some versions of Traveller, we would have been unable to reach our first star by the jump rules. Some books made the 100 ton spacecraft unique by starting at a drive capable of 2J. High Guard2e has set that back to 1J. This is why I decided many civilizations will encounter the two parsec dilemma and sacrifice tonnage to extend a ship for a second mid-jump but they must be sure there's a fuel source at the other end. Explorers would be the obvious first choice. Colony ships, haulers and other ship designs will have to decide how to deal with the J1 drive limit whether to sacrifice space for fuel or remain J1s and stick to the Mains. More than likely, most ships will stick to routes between worlds in close proximity to each other rather than along strings of worlds, in other words, there will be more ships hopping between a couple of worlds each. Fuel depots might be far more common in J1 societies to solve the limit. Rest stops to refuel, resupply and relax. Known throughout space for their distinctive spires facing galactic center and their bright orange roofs (look it up). I'd say during the J1 years, exploration will be far more selective for useful resources and colony habitation as time and distance will be premium. Some dirtballs might be just another rest stop on the way to actual valuable real estate. When J2 and J3 appear, these rest stops will become ghost towns or inhabited artifacts no longer needed like towns and villages passed by the freeway. Security(war) vessels might be very different than what 3I normally fields as these craft must carry more fuel and lose other things. You think regular Traveller designs are cramped? Might bigger ships be necessary to hold more yet run like a smaller vessel? Looking over the weapons selection up to TL 9, ships will look almost steampunk with missiles, torpedoes and the occasional pulse laser. I suspect the early explorers would not have an air/raft. They are exploring space and if they find something interesting it would be followed up by a properly equipped ship with the right personnel. The onboard scientist and lab would be oriented towards collecting system and planetary data. To properly explore a planet or even an orbital body would require a much larger ship and a more robust crew complement. The early jump ships might even sacrifice an ability to land on planets to save power/space. As for armaments, I would think the first ships would have no weapons at all. In theory they haven't found out just how crowded the universe is! Plus there would be no extrasolar pirates. Even intrasystem piracy may be a relatively minor thing. After all, where are you going to go and sell the cargo/ships without eventually having them return to the inhabited areas and getting caught? That's why I called them more specifically security ships. The flying of the flag over colonies. And these are concepts over the time period before reaching jump 2 which could have worlds settled for centuries with all the issues that produces. I agree the early exploration and commercial vessels won't need weapons anymore than we don't see them on commercial ships today. Even a hostile encounter could have only warships armed. I thought the air/raft would be useful if any extraordinary event might call for extended observation. And don't forget Traveller is still about adventure not absolute realism. It's the longboat to explore the island. The explorer class will never get into the nitty gritty details and leave that to larger surveyor classes. Last edited by Reynard on Sun Jun 10, 2018 1:24 pm, edited 1 time in total. At the very least, a missile launcher would let you launched probes and sensors into places you don't want to go or can't go yourself. Probe drones at TL 9 do cover the same thing, but if launched into an atmosphere you have to go and manually retrieve them (which an air/raft could do). So either a missile launcher (for disposable probes, actual missiles are a side benefit) or dedicated reusable probes with an air/raft to retrieve them. The air/raft also gives a way to safely leave a ship and descend to a planet if necessary, if something bad happens to the ship. A turret with a mining laser for use in asteroid mineral surveys would also be helpful. It also makes for a handy weapon in extreme circumstances. Drones are five per tonne, so you probably want a torpedo launcher, since torpedoes are three per tonne. Condottiere wrote: Drones are five per tonne, so you probably want a torpedo launcher, since torpedoes are three per tonne. For the ones launched from a missile launcher, I didn't mean probes as in probe drones. Just a canister with various sensors and a way to transmit data (plus whatever was needed to get it to the destination relatively safely and intact). Maybe a beacon of some sort to let next wave of explorers know where something interesting is. Something you can just launch and forget, as opposed to the robotic, moveable, more expensive drone. The rules don't currently cover them, but they should be possible. Besides that, that 1 ton per 5 drones would also include the launcher and controls, as well as storage and recharging of the drones. The drones themselves are said to be man-sized (High Guard pg 40, left column). A man isn't anywhere near 1/5th of a displacement ton. Even if you figure a man as a solid 2 foot diameter, 6 foot tall cylinder, you could easily fit 12 of those in a single displacement ton (with room to spare), the same as missiles at 12/ton. So if anything, the drones are more missile sized, not torpedo sized. Slightly smaller, and you can dump them out of the sandcasters. "A turret with a mining laser for use in asteroid mineral surveys would also be helpful. It also makes for a handy weapon in extreme circumstances." I would say mining surveyors would be one of many survey designs that would come after the explorer for more detailed information both for asteroid belt and planetary analysis. Makes me think what the predecessor of the lab ship would be. All these specialized vessels would be the second wave after the explorers bring back first surveys. Rather than one ship featuring a variety of sciences, there would be many ships dedicated to mining or biological science and others before dropping more permanent facilities on the system. 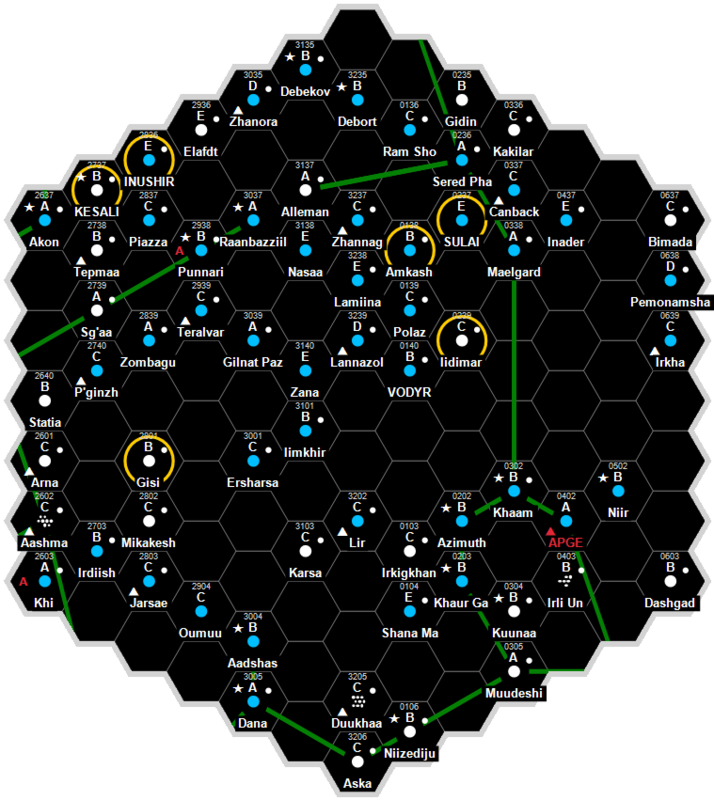 Beltstrike is an excellent source for an early Jump 1 campaign towards the exploration and exploitation of recently discovered system mineral resources. Making ships based on TL 9 would be great such as the Belt Seeker Singleship or the mining platform as a government or corporate venture. A initial general mining survey could give an indication of whether or not a more detailed mining survey needs to be conducted, or where to focus that survey. What is the purpose of a general exploration ship if any real exploration and survey is left to later, more specialized ships? IF you are going to send in the more specialized ships anyway, why build and send in the first general one? Getting a general idea of what kinds of resources are available in the system would seem to fall withing your original post. They gather as much macro information about a system for analysis as to the value for further research, economics and possible colonization but their spartan supply loads make long term and detailed exploration difficult without establishing supply depots and outposts. Without doing some basic mineral surveys, all you know is that rocks exist. That really tells you nothing about the "value for further research, economics and possible colonization". So just what is it these initial ships do? Anyone can tell the presence of planets/asteroids and general navigational issues, so I'm not seeing a point to these non-exploring exploration ships. Edit: For that matter, I'm not seeing what a more specialized ship would even include at TL 9. It isn't sensors, as you are limited to only Basic and Civilian grade sensors, and none of the specialized ones are available yet (life sensor and mineral sensor are both TL 12, so you can't even have an early prototype of them until TL 10). The only thing that would seem to vary at all would be laboratory space, but that is just a matter of equipment carried. You will also have colony ships. Dispersed Structure, modules full of colonists and supplies (say 1 Dton of supplies per colonist). The ship would be as big as they could make it. Say 1000 tons at TL9 maybe 2000 tons. Use 50-ton Modular Cutters to move the modules to the surface - they also would be used as the first habitat buildings. Colonists MIGHT be in Low Berths - depends on the setting and desperation of the colonists. The ship in the first post is also messed up. It is noted as having enough fuel for 2 jump-1 and 4 weeks of operation, but has double that amount of fuel listed. (You only need 21 tons for 2 jumps and 4 weeks). The fuel processor can also be halved in size, freeing up and additional ton. Fixing that gives you back 20 tons of cargo space, which can be used to add additional lab space and staterooms for additional scientists (or switch to double occupancy staterooms, which is noted as being often on exploration vessels). The workshop also seems to be 6 tons, whoch allows 2 people to work at the same time. You could probably reduces that to 3 tons for just 1 person, if it is possible. With no specialized sensors being available, and the ship now having more lab space for research and analysis, I see no real reason to have more specialized exploration vessels. Also, on small ships it is common for the pilot to also be the astrogator. That would free up one of the existing staterooms for use by another scientist or something. The minimum jump drive, 10 dT, can do J-1 with a 200 dT hull. Since the jump drive is the most expensive component we can just as well use a 200 dT hull for our Explorer, so get a much more capable ship for just 25% extra cost. Exploring means very long travel time out into the unknown; travelling 10 Pc takes 3 months one-way. Exploring something 20 Pc away takes one year's travel time plus whatever time the exploration takes, all without resupply or technical help. The ships have to be robust. The ships are not the result of a millennia of Imperial refinement, they are probably much less reliable than we are used to. Two hundred tonners represent the optimum size for the lower end of starships; ten tonne bridge, and minimum sized jump drive. Interesting. I wonder why there have been 100 ton scout vessels for 40 years? Reynard wrote: Interesting. I wonder why there have been 100 ton scout vessels for 40 years? Because some people make designs without looking at what actually makes sense first. And because what is true in MgT doesn't necessarily hold true in other editions.